At an evening match between Al Sadd and rivals Al Ahli last month, groups of “fans” told our reporter they had been paid about £5 to attend or had been given free tickets. They included several African security guards, who wore white robes they said helped them look more like Qataris. Indian construction workers said they had been paid chant football songs in Arabic they had been taught but did not understand. An entire end – about 1,000 spectators – comprised builders from south Asia. Musicians with drums and pipes had been hired to “create atmosphere”. “We are here for the money,” said Kumar, an Indian builder who had been bussed in from a labour camp. “They pay 30 riyals (£5) per match. They teach us the clapping actions and some songs. They think with the World Cup people will worry that there will be nobody to watch the matches so that is why they do this.” Michael, a security guard from Kenya, said: “They are looking for bodies because there is no one to come. The Qataris are not interested. Most are busy and they prefer to watch at home. We earn a minimum amount [in our day jobs] so if you get 30 extra riyals you can feed yourself better.” The migrant workers said their attendance at games was organised by middlemen who arranged bus transport from their dormitory camps and payments, which were normally made a day or two after the match. “I take 70 or 80 [workers] for a match and bring them by bus from the camps,” said a Sudanese agent. “I bring security guards and pay them 30 riyals.” He said he received about 60 riyals per “fan”. “It’s a good business,” he said. “I earn more than in my day job.” Qatar’s successful bid document for the 2022 tournament claimed the region was “brimming with sporting passion”. 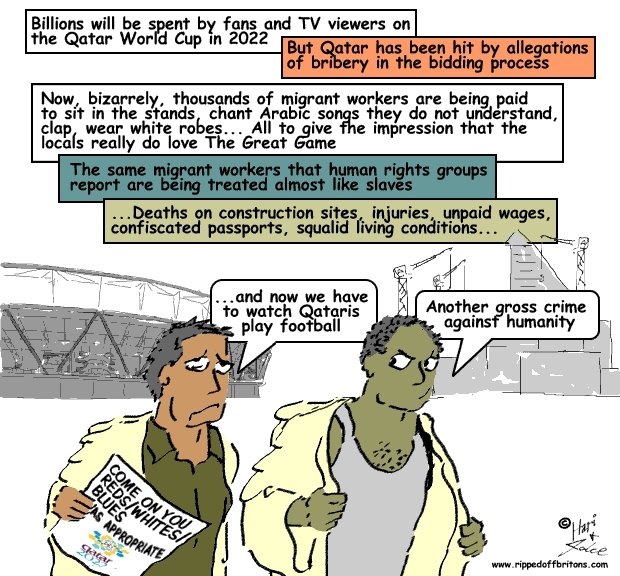 The World Cup preparations have been hit by allegations of bribery in the bidding process, strongly denied by Qatar, and outrage from human rights groups over the country’s treatment of migrant construction workers.